When it comes to leather, there are silent killers; agents that cause it to deteriorate, weaken and eventually rip, peel or crumble. You don’t see them coming because they usually creep up slowly, damaging your leather slowly, diminishing its original strength and beauty. When you know the enemy and have the right armoury of defence, keeping leather looking and feeling beautiful is easy. Watch out for these leather assassins. 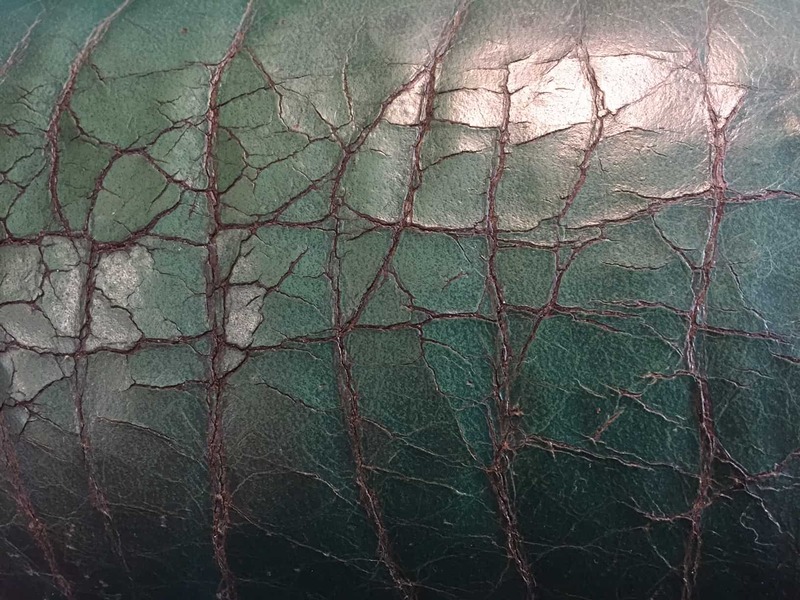 Read on to learn what damages leather and how to care for leather. When it comes to knowing how to care for leather, this is a big one. We need body oils or sebum to keep our skins looking and feeling young and supple. Without them, we’d be wrapped in itchy, dry, wrinkly old skin. So, if they’re that good for us, how can they be so bad for leather? Every touch and every rest of an arm on an armrest is coated with body oil that’s loaded with salts, enzymes, hormones and acids. Add medications and your leather is being force-fed a bitter pH cocktail that eats away at its insides. Whilst you and your pets are chilling on the sofa, you are slowly painting it with body oil. You don’t see its impact immediately but after a while, you’ll notice dark, greasy looking patches, cracks and flakes or delamination of the finish. This is a sign that oil has penetrated through the outer coating, accumulated and has literally rotted the fibres of your leather, turning it them to mush Oil soaked leather loses its strength, thins and tears. Sadly, it’s past a point of return and RIP once lovely leather. It doesn’t have to be this way. Wipe your upholstery with a professional grade leather cleaner every 3 months. This will intercept the accumulation of oils. Next, take out an ‘insurance policy’ for your leather by using a leather protector. This will help to repel oils, reducing their destructive impact. Harmless dust – no one ever said. 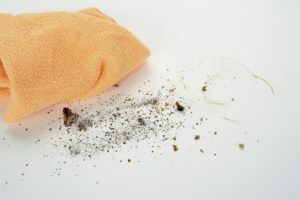 Although it seems insignificant, dust contains particles of matter such as soil, pollens, human and animal skin and hair cells, paper and textile fibres, ash, minerals and a myriad of other polluting substances. Mixed with body oils, perspiration and anything else that settles on the surface of your couch, it forms a sludgy paste. This is the dirt you see on your couch. Here, it acts like a sort of micro-abrasive sandpaper that erodes the manufacturer’s coatings. In the absence of a physical barrier, the sludge penetrates the leather via the pores where that harmless dust grinds the fibres and ultimately destroys your leather. Wet, chlorine or salt soaked cossies. Containing harsh chemicals, they have no place on leather so remember to change or dry off before sitting on your luxurious leather with a wet derriere. Another invisible assailant of leather is humidity. 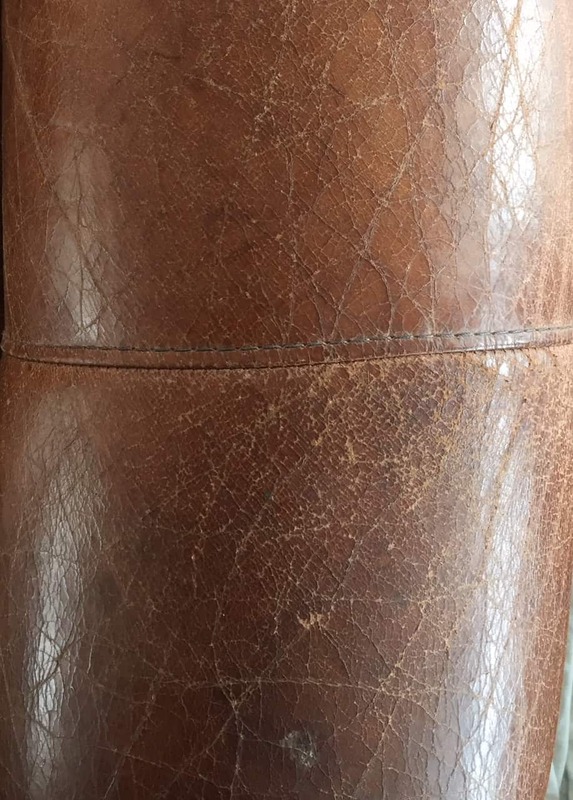 The effects of water on leather vary depending on the amount of water exposure. The amount of moisture in the air is considered “normal” when it’s around 30-40% relative humidity. This means the air is not too dry or too saturated. Entering via the thousands of pores in its surface, humidity is readily absorbed by leather. Some moisture is very beneficial to leather but too much is detrimental. With inadequate moisture, leather becomes dry, brittle and cracks. With optimal moisture, it stays soft and supple. Yet, with too much, mould and mildew can set in. In a warm, damp environment with poor circulation, airborne fungi and bacteria spores can embed in your leather. If it’s also carrying residual organics spills, you have the perfect climate for a lush mould and mildew garden. Other than managing the levels of humidity around your leather, regular cleaning is the best preventative and corrective measure. What if you and your leather jacket get caught in the rain? Don’t worry, your jacket will be fine providing you hang it in a protected space where the air circulates. Let it dry slowly. Don’t force dry it or hang it straight in your wardrobe whilst it’s still damp. 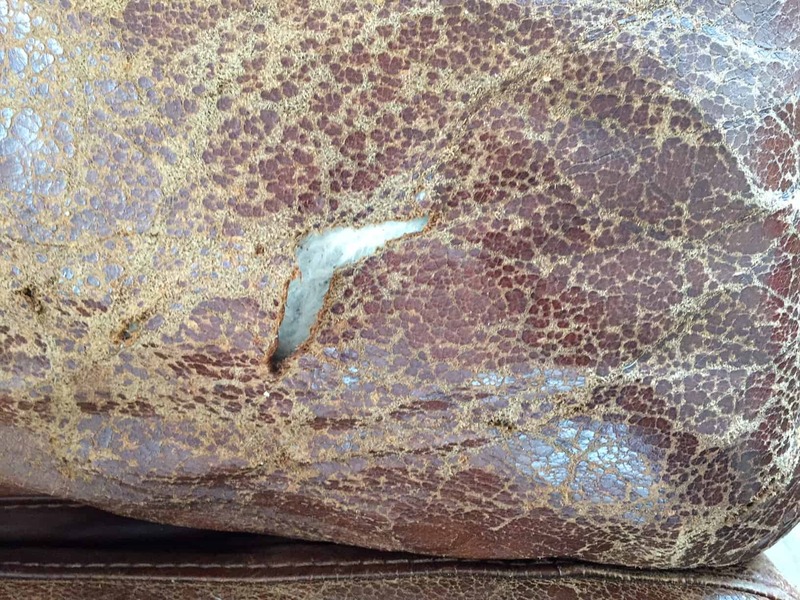 It can’t be said more simply; using the wrong products on your valuable leather can kill it. Just because it’s natural or already in your cupboard doesn’t make it harmless, cheaper or suitable. Boot polish, alcohol, perfumes, beeswax, hair spray, markers, window cleaner, nail polish remover, detergents and baby/wet wipes are unsuitable leather care products. They can dry out, fade, stain, crack, clog, mark or rot your leather. The damage they inflict can be swift or slow but always unforgiving and costly. Beware of seemingly harmless natural and home-made recipes such as olive oil leather conditioner. 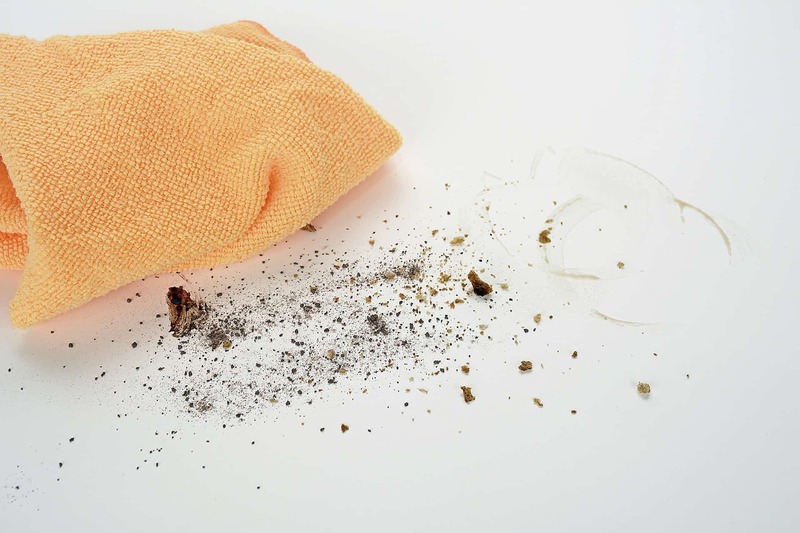 These remedies may look good on the surface but can wreak havoc on the inside of your valuable upholstery leather. Knowing how to care for leather is largely about using the right leather care products correctly. Stick to professional grade leather care products that are developed specifically for the health and longevity of your leather. Due to the porous nature of leather, airborne particles can penetrate and cause odours and discolouration. 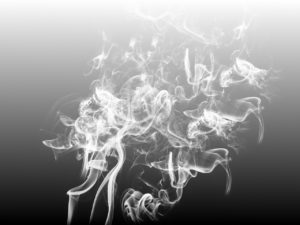 Leather that is frequently in an environment of cigar, cigarette and open fire smoke, as well as cooking fumes, needs a bit of extra care. To minimise the effects of smoke on leather, give it fresh air, regular cleaning and protection. When you know what damages leather, caring for it becomes easier. Adhere to a 3 monthly care regime using quality leather care products such as the Leather Hero’s Leather Care Kit. As time rolls on and it’s hard to regret taking good care of your things, including your leather furniture. Leather is robust, resilient, durable, flexible and generally, highly serviceable. It is widely regarded as a luxury material and can be expensive by comparison to alternatives. Yet, and probably due to these qualities, leather often provides years of service with no maintenance. Predictably, however, there is a tipping point when a once beautiful leather piece begins to show the effects of neglect, harsh environmental factors and the use of damaging products. The enemies of leather are often silent, invisible and subtle. Once aware of what damages leather and how to care for leather, you’ll be inspired to set a simple regime of regular care to protect and nourish your leather. Clean up spills immediately. If you catch a spill quickly, it may not become a stain. Set-in stains are almost impossible to remove and usually require refinishing to fully conceal. 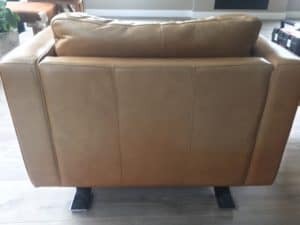 If not stitched in, fluff and rotate cushions regularly. Leather eventually moulds to the shape of its most regular position. Switch the cushions around, change seats and plump the cushions to prevent deep wrinkles, stretching and other signs of ‘’Dad’s chair’’ (Sorry Dads, it’s almost universally true that your favourite chair wears out first!). Alternatively, spread your use of your furniture evenly so that wear and tear are also even. Often lounge suites are discarded because one or two seats have deteriorated ahead of the rest of the suite. Clean and condition your leather upholstery every 3 months using professional grade leather care products. Use a leather protector to redcue soiling, UV damage and make cleaning easier. The work is light when it’s regular and the cost is minimal compared to purchasing new furniture. Don’t wait until your leather looks dirty. Many of the contaminants that damage it are invisible to the naked eye, such as hair and body oils. Fix accidents fast. Don’t live with life’s mishaps. Fix the cat scratches, remove the transferred dye and repair the tear. If DIY is not your thing, call a professional. Sweat is water with a dash of minerals, lactic acid and urea. Like body oil, perspiration is no friend of leather. Eating through the protective coatings, it actively damages the fibrous structure. Your leather’s salvation lies in a 2- pronged approach; prevention and remediation. On the hottest days, place a washable barrier such as a throw rug between sweaty bodies and your leather. Next, clean that invisible layer of sweat off your leather once every 3 months. It’s hard to remember to fight invisible foes, so put it on your calendar. Follow up with a coating of leather protector then apply a conditioner to show your leather that you care. Food, clothing, magazine and newspaper dyes can penetrate and stain leather. Remove the stain as soon as possible. Keep some transferred dye remover in your care kit. It will draw out all or most of the dye and any remaining shadow is best recoloured. Try Leather Hero Dye Remover to say goodbye to those unwanted colourful marks on your leather. How luxurious those moments spent in a comfy armchair by a window with a good book soaking up some warm rays of sunshine? Now imagine, you’re the leather armchair; you can never move away from the sun, even on the hottest of days. Imagine the effects on your skin. 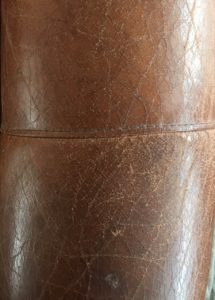 Leather left in the sun ages as prematurely like skin. It dries, cracks, bleaches and becomes brittle. Faded leather can bleach to a shade of grey, detracting from the original good looks. 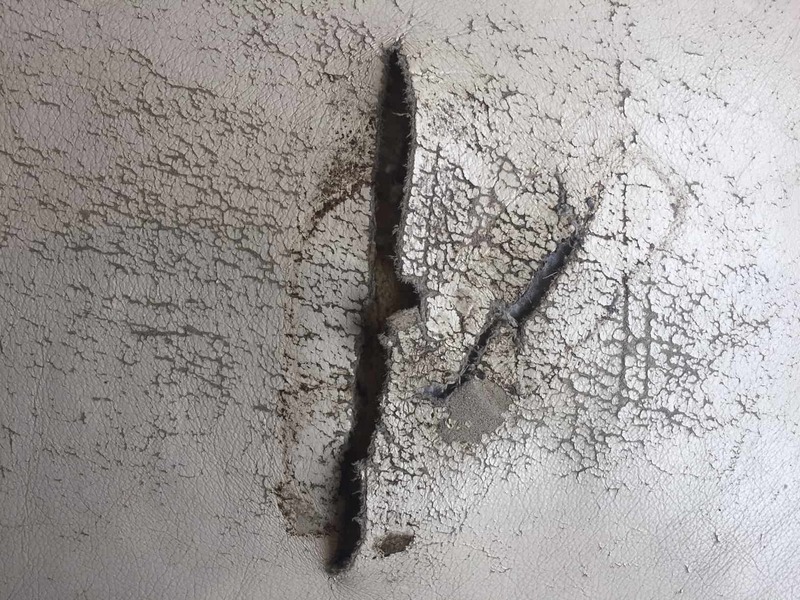 Similarly, heating vents and radiant heaters can rapidly damage your leather furniture, drying the out the fibres causing splits and rips. Use a good leather protector with UV filters to help prevent dye bleaching. Faded leather can be restored using professional grade leather dyes and pigments. When it comes to how to care for leather, placement and the use of UV filtering blinds is not one to overlook. Leather does not take kindly to rapid or extreme changes in temperature. Breathing’ through the pores, moisture is taken in and expelled out. When UV exposure is constant or temperature extremes occur, moisture is taxed out of leather leading to dryness and cracking. When it comes to how to care for leather on boats, you just need a good plan. Boats can’t avoid the sun and there’s not a boat owner who would want to. As much protection from covers as possible, very regular cleaning, a good leather protector and nourishment with a quality leather conditioner give sea dwelling leather the best chance of a long and healthy life. Leather Hero Protect No.2 uses advanced technology to impart superior UV protection for leather that can’t avoid a life in the sun. It’s fair to say that your adorable furry friend may not be a good friend of your leather lounge. Pet claws and other sharp things such as jean studs, zippers and scissors can damage your leather in a wild moment. 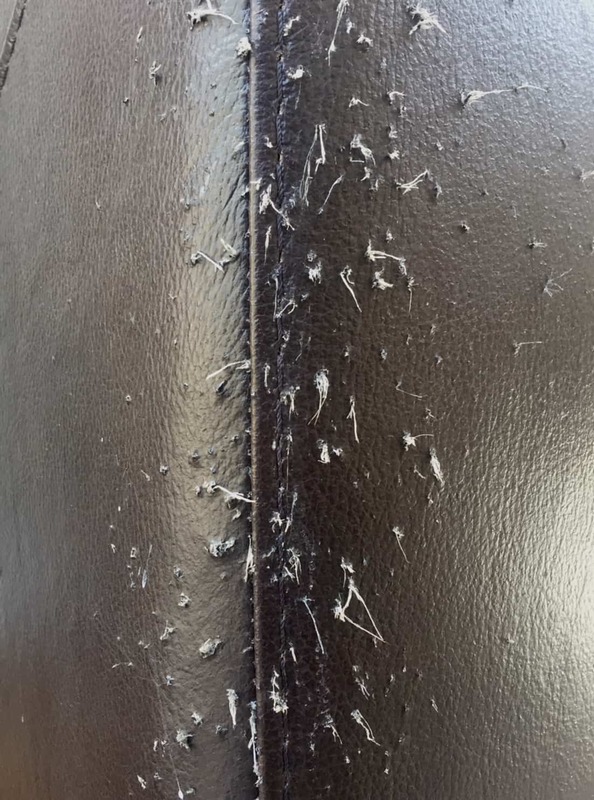 Whether it’s a dog jumping on and off or a cat that uses your lounge as a scratching post, their claws can rip deep gauges and leave your furniture in tatters. We know it’s not easy to prevent pet ‘vandalism’. Try using throw rugs, do additional training, facilitate their natural behaviours outdoors or place a scratching post indoors. If the damage is done, all is not lost. 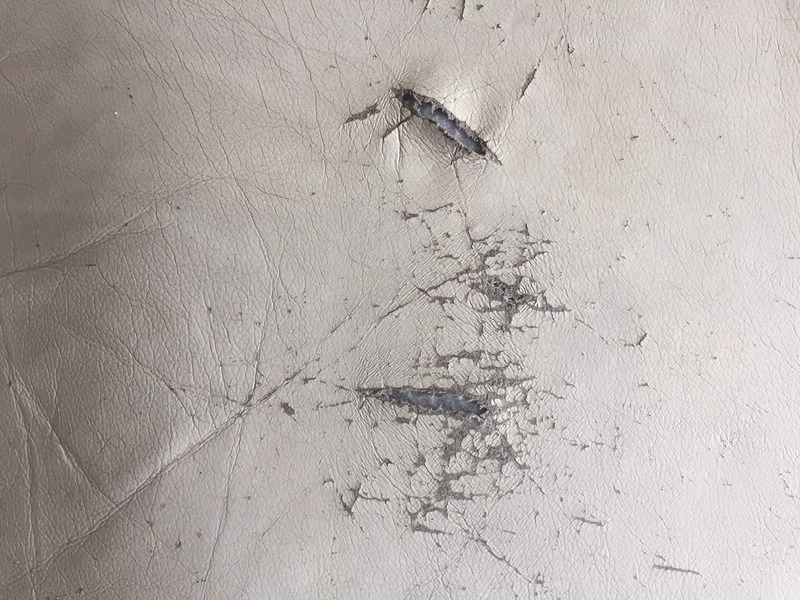 It is possible to restore pet damage using professional grade leather repair products such as the Leather Hero Small Repair Kit. Life should never be about becoming a slave to your possessions. Yet, following some simple guidelines can, with little effort, protect your investment in beautiful leather furnishings. So if you’ve been wondering what damages leather and how to care for leather, these are our tips. Be mindful of the effects of radical temperature changes, place leather away from windows and heaters, provide pet beds and train your furry friends to love them, remove stains asap and give your furniture a quick once over every 3 months (no scrubbing required). You’ll be glad you did. “Natural” – that’s always best, right? If it’s good for human skin how can it be bad for leather? Sometimes, it hard to know whether it’s OK to use the products from our cupboards or whether a specialist leather care lounge kit is actually necessary. It’s tempting to conclude that a homemade natural product is superior to one made from unpronounceable ingredients. Sounds fair but does it actually ring true when it comes to leather upholstery? 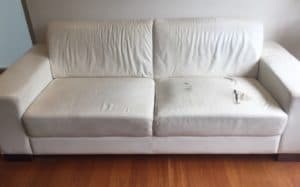 To answer all of these questions, let’s look at leather upholstery, leather lounge care, homemade leather conditioner, the leather top coat finish and the science of leather. Leather is tanned hide. Although biodegradable both as skin and as leather, tanneries process hides to render them more resistant to decomposition thus producing a flexible and durable material. With few exceptions, tanneries make leather using tanning chemicals that preserve and soften the hide. They treat the raw leather with dyes, pigments and protective leather top coat finish coatings to enhance the feel, create a great diversity of aesthetic finishes and render a highly serviceable material. In a nutshell, the leather we buy is natural raw material that is chemically treated to create a viable consumer product. What does upholstery leather need to last? Leather has been around for a very long time; since cavemen, really. After centuries of development and scientific research by leather industry leaders, experts agree that the optimum care regime for leather upholstery includes three main products; a pH neutral cleaner, a lubricating conditioner and a breathable leather protector. A premium leather lounge care kit is biodegradable, non-toxic and water-based. Professional grade leather care products have been tested and proven to help maintain, repair and maximise the beauty and longevity of leather upholstery. In fact, it’s widely accepted that correctly maintained leather lasts around three times longer than leather that is left untreated or is treated with the wrong products. By preserving the leather top coat finish, the material is protected and preserved. ‘OK great’, you might say, ‘but that doesn’t mean natural remedies are harmful’. In truth, to those in the leather care industry, who’ve seen first-hand the impact of these concoctions and inappropriately used household cleaners, it does. The internet and social media host a plethora of homebrew leather care recipes where everything from vinegar, baby soap, olive oil, essential oils, massage oils, coconut oil and coco butter are recommended. A homemade leather conditioner may remove some surface dirt and leave a glossy shine but that’s where the good news ends. Tricking you into thinking that you’ve given your leather a nourishing feed, that glossy shine is sticky, attracts and holds dirt and airborne particles – (think ‘’tarred and feathered’’ on a super fine level). With repeat applications, leather becomes coated in a tacky sludge that clogs the pores and does nothing for its health or beauty. And that’s just on the outside; on the inside, the situation is worse. It’s an unfortunate myth that oil acts to nourish upholstery leather when in reality it actively accelerates its deterioration. Many articles recommend olive oil as a leather conditioner. If you’ve seen the effects of human oils (hair and body) on leather, you might rightly question this recommendation. Oil readily soaks into the highly permeable fibres of leather. Under the surface, it spreads and eventually resurfaces, appearing as dark greasy patches. When this happens, delamination (or peeling) of the maker’s coatings ensues. The appeal of homemade leather condition is easy to understand; it seems harmless; we eat it, after all. You get instant results with the appearance of moisturisation, minimised scratches, a colour and shine boost and there may even be improved suppleness. However, what you can’t see is that the oil has begun rotting your leather from the inside out. Once embedded deep within the structure, it cannot easily be removed. Oddly, household cleaners are often unwittingly used to inflict fatal damage to leather upholstery. Never risk your investment by resorting to the likes of nail polish remover, wet wipes, markers, orange oil, hairspray, sunlight soap, kitchen and bathroom abrasives, eraser sponges or window cleaner – and the list goes on. Often containing alcohol, acetone and abrasives they can strip protective leather top coat finish coatings, remove or change colours, dry out, mark, clog and suffocate your leather. A red wine spill was cleaned using a bathroom & kitchen cream abrasive. Large rips and delamination mark the scene of the crime. stainless steel polish on your wooden dining table! 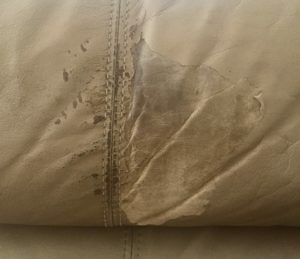 Choose a professional grade leather lounge care kit to avoid this type of damage. Leather is slightly acidic with a pH level of 4.5. Most household cleaners are alkaline with pH levels of 9 or above. When in contact, this differential creates a chemical reaction that affects not only the surface but also the fibrous structure of leather. The greater the differential, the greater the effect. The use of alkaline cleaners weakens the fibres, slowly breaking them down. You won’t see this happening. What you will see is the inevitable drying and cracking that results. 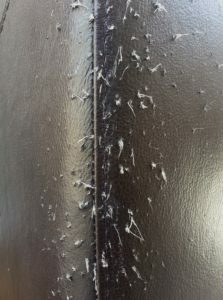 Further compounding this damage, household cleaners can strip the manufacturers leather top coat finish and colour coatings. Without them, leather is exposed to everyday abrasion, body oils and soiling. Different leathers require different care. When it comes to leather lounge care, boot polish is for boots and saddle soap is for saddles. Furniture leather ‘breathes’, taking in and expelling moisture through the pores. 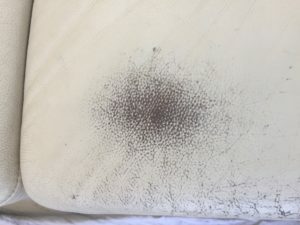 The wrong type of conditioner, conditioning without cleaning beforehand or indeed, too much conditioning can clog the pores, trapping dust, dirt and grime within the structure. Leather furniture can cope with an occasional wipe with a water dampened cloth. 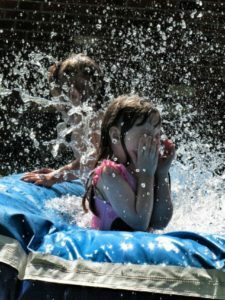 Too often or too much water and big problems occur. Penetrating through the leather top coat finish and deep into the fibres, water can bond with and transport the lubricating fats (that keep leather soft and supple) out through the pores. The result? 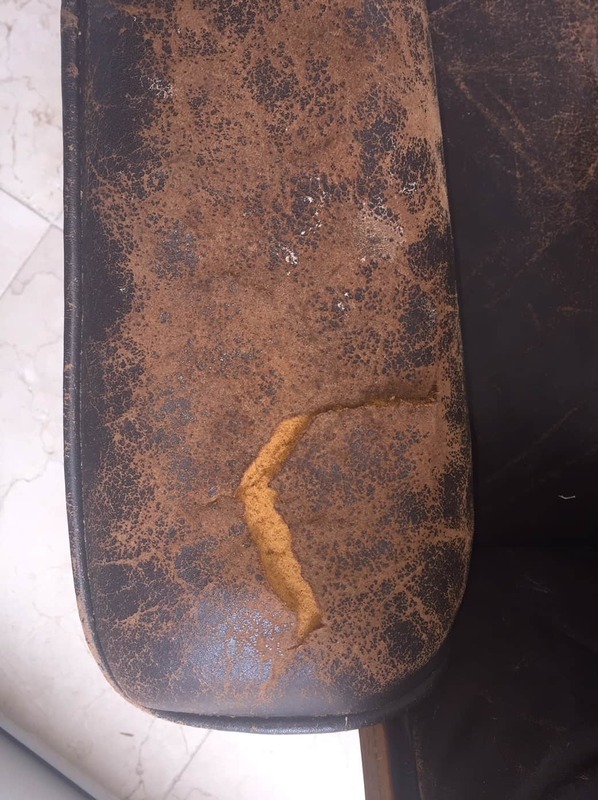 dry cracked and ripped upholstery. Selecting the correct leather care products for your leather type is essential to maintaining the health and beauty of your leather upholstery. Leather care products are more expensive than some other domestic cleaners. A good leather lounge care kit is designed to be used in an emergency (such as a red wine spill) and periodically (every 3 to 6 months) as part of a long-term care regime aimed at extending the longevity of leather upholstery. Pantry ingredients are generally far cheaper. However, mixing a homemade leather conditioner to make a home recipe takes time and costs can add up quickly. 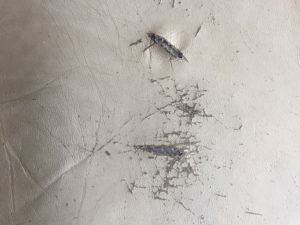 If that recipe then causes damage to your leather, the real cost is the early demise of your furniture. Leather can be an expensive luxury; an investment in quality. It makes sense then, to care for it correctly. Love your leather by giving it what it needs. Avoid false economies, myths and shortcuts. Use a quality leather lounge care kit made especially for leather and it will look and feel beautiful long into the future. Not sure what type of leather you have?